Some days it seems like the Marvel Cinematic Universe keeps rushing onto the screen like the Hong Kong subway; wait a few minutes, and a fresh train is going to come along. 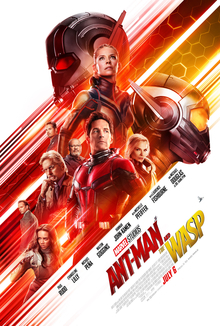 Having already found enormous critical and commercial success with Black Panther and Avengers: Infinity War, Marvel Studios have released what is technically their fifth feature film in 12 months (Spider-Man: Homecoming turns one year old a day after Ant-Man and the Wasp hits cinemas). What is remarkable about Marvel’s current run is that their films genuinely seem to be getting better of late. Spider-Man: Homecoming was an unexpectedly engaging relaunch for its protagonist. Thor: Ragnarok had a strong creative direction and fresh tone – while I personally didn’t entirely warm to it, I can recognise the artistry involved. Black Panther felt like a zeitgeist moment for American popular culture, and soon after that Infinity War pushed the MCU to a larger scale and to higher stakes than any film before it. With such an expanding sense of quality and ambition, it actually feels somewhat unfair to release Ant-Man and the Wasp so soon in the year. It could have been released at year’s end, particularly given that Disney don’t have a Star Wars film for Christmas this year. Instead it has been dropped into a early July slot, and feels weirdly like a moderate let-down. The film picks up two years after the events of Captain America: Civil War, in which Scott Lang (Paul Rudd) nears the end of his house arrest following the events of that picture. He is legally not allowed to contact Ant-Man inventor Hank Pym (Michael Douglas) or his daughter Hope (Evangeline Lilly), both of whom remain fugitives thanks to Scott using their technology to aid Captain America in fighting the Avengers. Hank and Hope, however, have plans for Scott whether he is in custody or not: using his experience in the quantum realm (during the first Ant-Man) to locate and recover Hank’s long-lost wife Janet Van Dyne. Two things stand in their way: an illegal technology dealer (Walton Goggins) has an eye on stealing their laboratory and the dicoveries hidden within, and a mysterious young woman (Hannah John-Kamen) with the ability to phase her body in and out of reality seeks Hank’s quantum tunneling technology for herself. The film’s biggest problem is that neither of those two antagonists ultimately feel like enough of a threat to sustain a movie. They are hurdles for sure, and provide a series of chases and complications, but there is never any significant sense of threat. The film compensates with plenty of snarky dialogue and comedic moments, but as a follow-up to the Avengers literally attempting to save the universe it all feels very unremarkable. It is an enjoyable film, but at no point does it feel a necessary one. I really enjoy Paul Rudd’s take on the character, and the supporting cast acquit themselves wonderfully. I really enjoyed many of the cleverly contrived set pieces, and the imaginative use of shrinking and growing technology. At no point, however, did it feel like a must-see movie experience. To its credit it does give a female superhero an unprecedented major role in a Marvel film. Marvel Studios have even been quite keen to press that it’s the first of their 20 films to include the name of a female character in the title – as if that’s a laudable claim and not a tacit admission that their treatment of women has been relatively dreadful over the past 10 years. Evangeline Lilly is great as Hope, aka the Wasp. We can only hope Marvel use her more broadly in future films and spin-offs. It is a weird way for a film to fall between two stools: its comedic aspects are its best asset, yet overall the film seems unwilling to fully commit to that direction. With so many Marvel productions hitting the screen, it is important to keep them varied and distinct from one another, and Ant-Man is perfectly developed to be a fabulous comedy franchise. At the same time the film tries valiantly to pull a powerful, personal story out of the material. To an extent one sabotages the other, and there’s not enough originality or urgency in the latter to justify weakening the former. The film is, as I’ve noted, enjoyable. In the broader scheme it feels like a decidedly minor work.